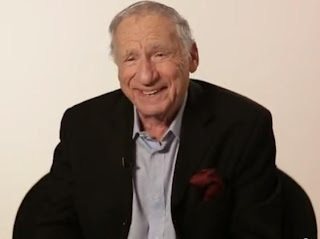 Today is Mel Brooks' 87th birthday and we wish him a very happy one and many more in the years ahead. This has been quite a year for Mel. He was the recipient of a Life Achievement award from the American Film Institute. He was the subject of a PBS American Masters TV Special, achieved an Honorary Fine Arts Degree from the AFI, and released a new 5-DVD comedy collection. After returning home from World War II, Mel got his start in stand-up comedy at the Butler Lodge in Hurleyville, New York, in the Catskills Borscht Belt. He went on to become a film director, screenwriter, composer, lyricist, comedian, actor, and producer. To mark his 87th birthday, we're sharing a recent interview with The Hollywood Reporter's Scott Feinberg at the TCM Classic Film Fest. In the interview, he reflects on how he got his start in comedy, how he first crossed paths with Sid Caesar, and the legacy he'd like his films to leave. You don't have to be Ashkenazi Jewish (to enjoy a Mel Brooks movie), but it helps. His humor is on multiple levels: General (everybody gets it), Jewish Lite (for Reform) and Jewish Heavy, for observant Jews. Pity there wasn't more of Clevon Little in the clip; very funny man who died too young. To Mr. Brooks: Ad mea KAY esrem. Ed, I'll try to keep you in 7th Heaven, but please understand that Jewish humor is more than just comedy. As I often say, the blog includes jokes, satire, books, music, films, videos, food, unbelievable but true happenings, and funny stories in the news. The month of July will have more comedy than usual, as we lead up to the release at the end of the month of the new film "When Comedy Went to School" about the Catskills comedians.